Leaf blowers are rather simple tools. They are just a motor or engine that pushes air at high speeds. In the past, small engine mechanics made these unnecessarily complicated, requiring maintenance and oil/gas mixtures. Electric leaf blowers have solved that problem. No maintenance. No gas. Just blowing leaves. Many of the electric leaf blowers we carry double as leaf vacuums as well. This allows for more versatility and functionality. The vacuum capability allows you to turn up to 16 bags of leaves down to one bag of mulch for easy disposal. Look for a model with tool-less conversion, so you can quickly and easily turn your blower into a vac. 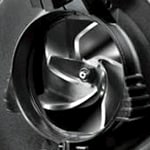 The impeller in an electric leaf blower creates air flow, but blower/vacuums also use this impeller to mulch up dried leaves as they're pulled in. This helps to reduce the how much space they take up, allowing you to fit more leaves into the vacuum bag. Impellers can be made of metal or plastic. If you plan to utilize the vacuum function frequently, you should choose a metal impeller for longevity and lasting performance. The metal impellers will hold up better if you accidentally vacuum small pieces of debris that aren't as malleable as dry leaves. If you've ever owned or used a pesky two-cycle leaf blower, you know how frustrating a small engine can be. You need to mix gas with oil for the gas tank, perform routine maintenance like replace spark plugs, and worst of all, yank a recoil start rope to get it going. your clean lawn in no time. Corded Electric Leaf Blower Buying Guide.. Our Power Equipment Direct how-to library can help you learn about Shindaiwa Leaf Blowers, Proposition 65 Product Labeling and Sales Tax Information.